Please select an option Kitty cat Unique unicorn Puppy dog Mousy mouse Dear deer Big elephant Richard rabbit Gerald the giraffe. _all 8 styles Please select a STYLE. These beaded DIY toys are all rolled in one! 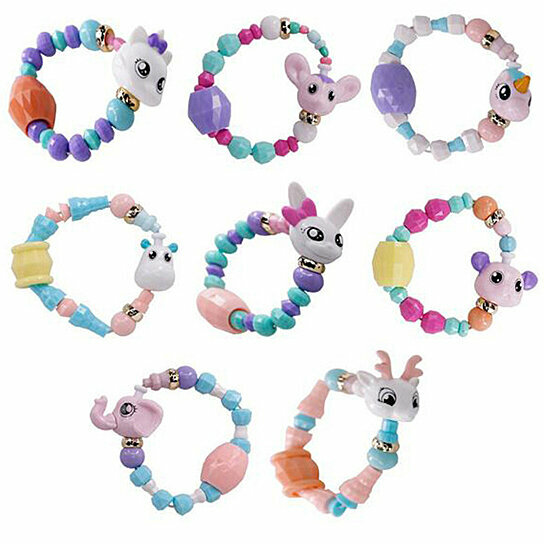 The beads can be made into necklaces and bracelets to any shape of an animal of your choice... So much fun create sparkly jewelry to wear that caters to your mood and catches your fancy! Made from supple and nontoxic ABS material. Each toy measures 305 * 250 * 165 mm. Develops imagination, intellect, and interest. The hand and eye coordination develop small motor skills. They come in pastel candy colors. They come in shapes like KITTY CAT, UNIQUE UNICORN, PUPPY DOG, MOUSY MOUSE, DEAR DEER, BIG ELEPHANT, RICHARD RABBIT, AND GERALD THE GIRAFFE.